A healthy pizza is a simple appetizer guests will love. 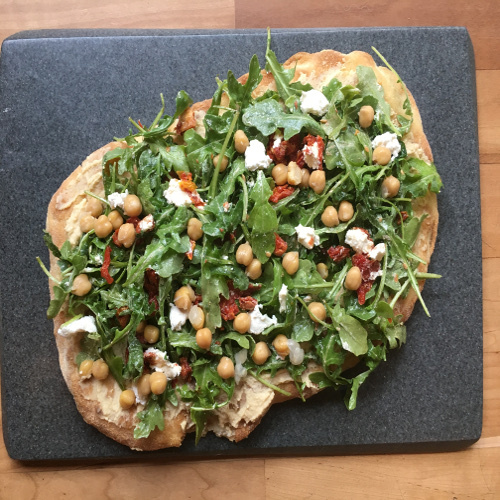 Swap the usual tomato sauce for hummus, and add in arugula and chickpeas for a nutrition boost. Beautiful, tasty and easy to eat! 1. Preheat oven to 425 F. Brush 1 Tbsp olive oil over crust, and bake for 10 minutes or just until lightly browned. 2. Spread hummus over crust. 3. In a small bowl, combine arugula with other 1 Tbsp oil along with remaining ingredients. Scatter over pizza. Cut into 6 pieces and serve immediately.